The Times of Israel is live blogging events as they unfold late Friday and into Saturday. The office of the French President Francois Hollande says that at least 1,500 extra soldiers have been deployed to Paris after the deadly attacks tonight. A French police official says top government officials including President Francois Hollande were headed to the Bataclan concert hall where hostages were taken. According to police, at least 100 people were killed in the theater. A police assault on the venue finished earlier tonight, leaving at least two attackers dead, officials say. Facebook has activated its Safety Check feature — allowing users to alert friends and others that they are safe — following the deadly terror attacks in Paris which have claimed the lives of at least 140 people tonight. Screenshot from Facebook’s ‘Safety Check’ feature allowing users to report that they are safe. Prime Minister Benjamin Netanyahu says Israel stands “shoulder to shoulder” with France in the “war against terrorism” after a deadly string of attacks in Paris left at least 140 dead tonight. “Israel stands shoulder to shoulder with President Francois Hollande and with the French people in the war against terrorism,” Netanyahu said as he offered his condolences to the families of the victims. French police say that about 100 people were killed inside the Bataclan theater in Paris tonight, bringing the total death toll from the multiple terror attacks across the French capital to 140. Dozens of people are dead inside Paris’ famous Bataclan theater where a terrorist attack took place earlier tonight, and some 100 people were taken hostage. The death toll is expected to rise as the situation becomes clearer. Police launched a raid and killed two attackers a short while ago. One Paris official described “carnage” inside the building, saying the attackers had tossed explosives at the hostages. A doomed Russian passenger jet lurched up and down before plunging 31,000 feet after being blown apart by an ‘external impact’, airline bosses have revealed. Travellers still strapped in their seats were sucked from the stricken Airbus A321 through a hole at the back of the jet when the tail blew off 23 minutes after leaving the Egyptian Red Sea resort of Sharm El Sheikh, it was claimed. 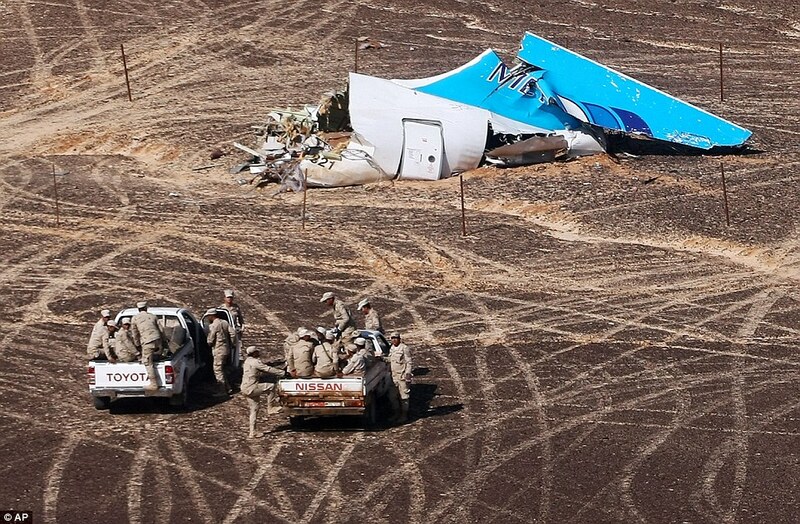 The plane twice abruptly climbed nearly 3,000 feet in three seconds before falling 3,000 feet moments later in the final minutes before disappearing from radar, crashing in the Sinai peninsula with the loss of all 224 passengers and crew. The news comes as US officials claim an American infra-red satellite detected a heat flash on the route the aircraft was taking seconds before the plane fell from the sky, suggesting there was some sort of explosion on board. 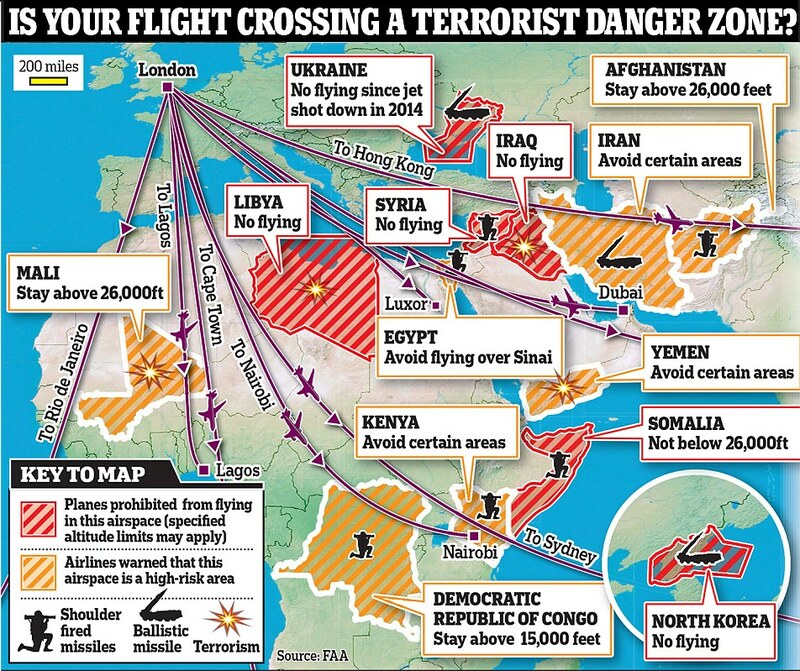 Passenger jets leaving Britain routinely fly over areas of the world where conflict on the ground could put them at risk. The risk was brought into tragic focus in July last year when a Malaysia Airlines passenger flight was shot down in eastern Ukraine by a missile launcher allegedly operated by pro-Russian separatists. All 298 people aboard Flight MH17 were killed. Since then, with the exception of direct flights into Kiev, most airlines have avoided Ukrainian airspace. However, MH17 is thought to have been destroyed by a sophisticated long-range missile – not the shoulder-launched devices obtained by IS gunmen and other rebel groups. These normally have maximum vertical range of 15,000 to 20,000ft, much less than the cruising height of commercial airliners. Aviation authorities issue ‘Notices to Airman’ that place restrictions on commercial flights operated by carriers crossing hazardous airspace. For the world’s most dangerous areas – including Syria and Libya – all flights are banned. But in others restrictions only apply to flights below a certain altitude, usually around 26,000ft, depending on the perceived range of anti-aircraft weapons available to gunmen in those countries. Warnings issued by the US Federal Aviation Administration cover global hotspots including Libya, Iraq, Yemen and parts of the Sinai Peninsular in Egypt. They are regarded as an international standard. The Department for Transport’s list of flying restrictions for nine countries issued to British carriers is almost the same but also includes Pakistan. Planes flying over such areas are warned not to go beneath 26,000ft because of the risk from terrorist or rebel fighters. In many cases – such as the Ukrainian capital Kiev – the no-fly rule does not include direct flights in and out. Many terror groups around the world have access to the shoulder-launched surface-to-air missiles, known as MANPADS – or Man-portable air-defence systems. They were developed by the US and Russia in the Cold War. They are a threat to low-flying aircraft, especially helicopters, and it is possible they could be used to attack an aircraft taking off or landing. In February 2003, then Prime Minister Tony Blair sent armoured vehicles to Heathrow in response to intelligence warning of an ‘extremely probable’ terrorist attack. While it did not happen, it is likely that such an attack could have involved the use of MANPADS. The data does not show the heat flash travelling at any time, as would be the case had a ground-to-air missile been launched in the plane’s direction. Instead, the satellite evidence illustrates that there was just a single burst of ferocious heat on the jet’s path. That has now opened up the possibility that a bomb on board, or an explosion in a fuel tank or engine as the result of a mechanical failure, caused the plane to come down. Ankara (AFP) – Turkey on Wednesday sacked Ankara’s top police chief and two other officials as President Recep Tayyip Erdogan admitted security shortcomings over a double suicide bombing in the capital that killed 99. There has been growing anger against Erdogan and the government for alleged security lapses over the worst attack in modern Turkey’s history in which two suicide bombers blew themselves up in a crowd of peace activists on Saturday. Announcing the first dismissals in the wake of the disaster, the interior ministry said Ankara police chief Kadri Kartal as well the head of the city’s police intelligence and security departments had been removed from their posts. It said they had been sacked on the suggestion of investigators “to allow for a healthy investigation” into the atrocity. In his first public remarks on the bombings late Tuesday, Erdogan admitted there were security shortcomings and ordered the State Supervisory Council (DDK), an inspection body attached to the presidency, to undertake a special investigation. 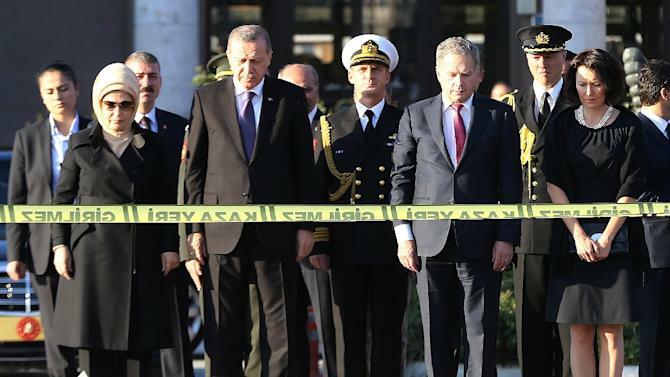 On Wednesday, Erdogan made his first visit to the site of the bombings outside Ankara’s main railway station, laying flowers for the victims alongside visiting Finnish President Sauli Niinisto. Prime Minister Ahmet Davutoglu meanwhile announced that the toll from the bombings had risen from 97 to 99 dead, and that one Palestinian man was among those killed. “Ninety-four corpses have been returned to the families and four corpses are to be given to families who have been informed,” Davutoglu told Show TV in an interview. ANKARA, Turkey —Nearly simultaneous explosions targeted a Turkish peace rally Saturday in Ankara, killing at least 95 people and wounding hundreds in Turkey’s deadliest attack in years — one that threatens to inflame the nation’s ethnic tensions. There was no immediate claim of responsibility, but Prime Minister Ahmet Davutoglu said there were “strong signs” that the two explosions — which struck 50 yards apart just after 10 a.m. — were suicide bombings. He suggested that Kurdish rebels or Islamic State group terrorists were to blame. 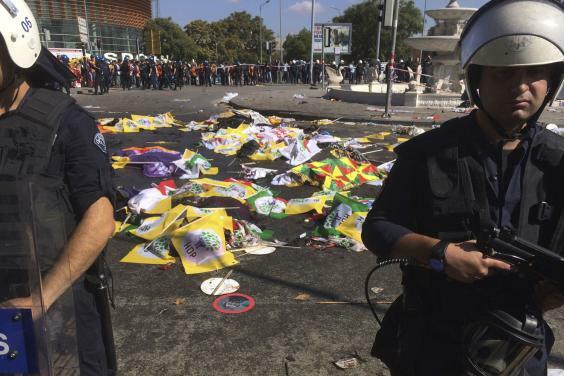 The two explosions occurred seconds apart outside the capital’s main train station as hundreds of opposition supporters and Kurdish activists gathered for the peace rally organized by Turkey’s public workers union and other groups. The protesters planned to call for increased democracy in Turkey and an end to the renewed violence between Kurdish rebels and Turkish security forces. Saturday’s attacks came at a tense time for Turkey, a NATO member that borders war-torn Syria, hosts more refugees than any other nation in the world and has seen renewed fighting with Kurdish rebels that has left hundreds dead in the last few months. Many people at the rally had been anticipating that the rebels of the Kurdistan Workers’ Party, or PKK, would declare a temporary cease-fire — which it did hours after the bombing — to ensure that Turkey’s Nov. 1 election would be held in a safe environment. Television footage from Turkey’s Dogan news agency showed a line of protesters Saturday near Ankara’s train station, chanting and performing a traditional dance with their hands locked when a large explosion went off behind them. 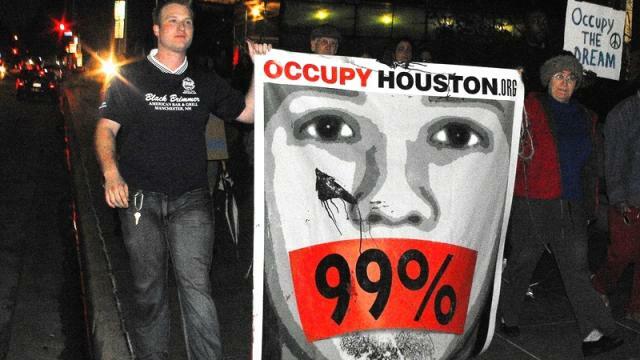 An Associated Press photographer saw several bodies covered with bloodied flags and banners that demonstrators had brought for the rally. Terror Attack in Turkey on Saturday, 10 October, 2015 at 09:49 (09:49 AM) UTC. Thirtly people have reportedly been killed and more than 100 wounded after a suspected terrorist bomb attack in the centre of Turkish capital Ankara. Two explosions shook a road junction in the centre of the city on Saturday as people were gathered for a “peace” march to protest against the conflict between the state and Kurdish militants in southeast Turkey. The Turkish government put the death toll at 30 and said 126 people were injuried. Images of the chaos showed dreadful scenes inculding bodies lying in the road, many draped in flags and banners, and marchers desperately trying to help the wounded. Witnesses said the ground was covered in bloodstains. Authorities were investigating claims the attacks were carried out by a suicide bomber. Prime Minister Ahmet Davutoglu was due to hold an emergency meeting with the heads of the police and intelligence agencies and other senior officials. Witnesses said the two explosions happened seconds apart shortly after 10am local time (7am GMT) as hundreds gathered for the planned rally. Violence between the state and the Kurdistan Workers Party (PKK) militants has flared since July, when Turkey launched air strikes on militant camps in response to what it said were rising attacks on the security forces. Hundreds have since died. The attacks come three weeks ahead of a parliamentary election in Turkey and at a time of multiple security threats, not only in the restive southeast but also from Islamic State militants in neighbouring Syria and home-grown militants. At least 86 people have been killed and nearly 200 wounded after the suspected double sucide bombing of a “peace” march in the Turkish capital Ankara. Two explosions went off within seconds in the centre of the city on Saturday as hundreds of people were gathered for the rally protesting against the conflict between the state and Kurdish militants in southeast Turkey. There was no immediate claim of responsibility for the deadliest attacks in Turkey in years. Prime minister Ahmet Davutoglu said there were “strong signs” that the attacks – which struck 50 metres apart and left 186 people wounded – were suicide bombings. 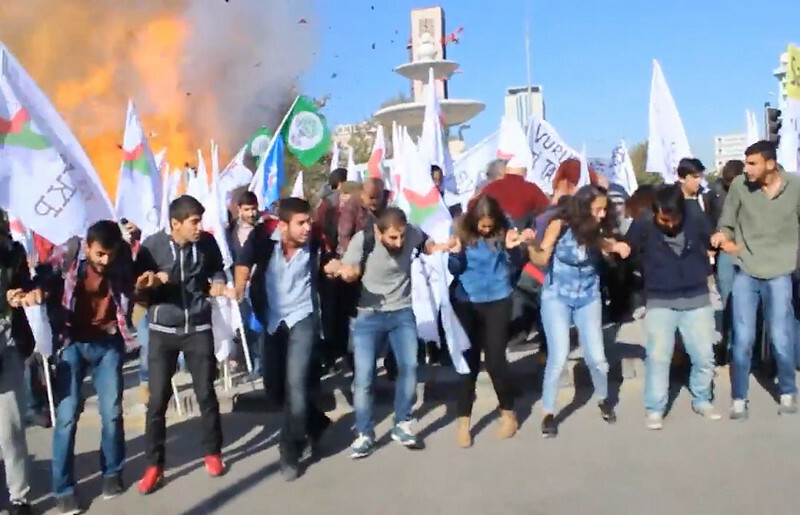 Busloads of activists had travelled to Ankara from other cities to attend the peace rally. Health minister Mehmet Muezzinoglu said 62 of the blast victims in Ankara died at the scene, while 24 others died after being taken to the hospital. Images of the chaos showed dreadful scenes including bodies lying in the road, many draped in flags and banners, and marchers desperately trying to help the wounded. At least thirty people are dead and 126 wounded in a terror attack that targeted a peace rally in the Turkish capital Ankara. Two explosions rocked the main train station in the city, were thousands had gathered to protest against the long-running conflict between Turkey and the Kurdish separatist group, the PKK. Government officials say the blasts were a terrorist attack and are investigating reports that a suicide bomber was behind at least one of the explosions. Prime Minister Ahmet Davutoglu is being briefed by the interior and health ministers, state news agency Anadolu says. The wounded are being treated in various hospitals after the explosions, which occurred at 10:05 am local time (7:04 GMT). The country’s interior ministry confirmed that at least 30 people were killed in the blasts. Those killed and injured had gathered for a rally organised by unions and civil society groups, the ministry said in a written statement. A Reuters reporter at the scene saw at least 20 bodies covered by flags, with bloodstains and body parts scattered on the road. “Bodies lay in two circles around 20 metres apart where the explosions had taken place,” they reported. Witnesses said the blasts were seconds apart shortly after 10am and were so powerful they rocked nearby high-rise buildings. No group has yet claimed responsibility for the blasts, which come three weeks ahead of a parliamentary election. A rally for the pro-Kurdish HDP party was bombed in June, ahead of last year’s general election. The country has been in a heightened state of alert since starting a “synchronised war on terror” in July, including airstrikes against Islamic State fighters in Syria and PKK bases in northern Iraq. Designated a terrorist group by Turkey, the United States and the European Union, the PKK launched a separatist insurgency in 1984 in the south-eastern part of the country. More than 40,000 people have been killed in the conflict to date. Two bomb explosions targeting a peace rally by leftist and Kurdish activists in Turkey’s capital on Saturday killed at least 86 people and wounded 186 others, Turkey’s Interior Ministry says. The explosions occurred minutes apart near Ankara’s main train station as people were gathering for the rally, organized by the country’s public sector workers’ trade union and other civic society groups. The rally aimed to call for an end to the renewed violence between Kurdish rebels and Turkish security forces. It was not clear if the attacks, which came weeks before Turkey’s Nov. 1 elections, were suicide bombings. “There was a massacre in the middle of Ankara,” says the head of the Confederation of Public Sector Trade Unions. “Two bombs exploded in very short intervals.” Television footage from Turkey’s Dogan news agency showed a line of protesters fanned out on the street near the train station, chanting and performing a traditional dance with their hands locked, when a large explosion hit behind them. An Interior Ministry statement condemned the attack, which it said “targets Turkey’s democracy and peace.” Prime Minister Ahmet Davutoglu called an emergency security meeting to discuss the attack. There was no immediate claim of responsibility. In July, a suicide bombing blamed on ISIS killed 33 people in a town near Turkey’s border with Syria, and a leftist militant group has also carried out suicide bombings in Turkey. Nearly simultaneous explosions targeted a Turkish peace rally Saturday in Ankara, killing at least 95 people and wounding hundreds in Turkey’s deadliest attack in years – one that threatens to inflame the nation’s ethnic tensions. There was no immediate claim of responsibility but Prime Minister Ahmet Davutoglu said there were “strong signs” that the two explosions – which struck 50 meters (yards) apart – were suicide bombings. He suggested that Kurdish rebels or Islamic State group militants could be behind the attacks. 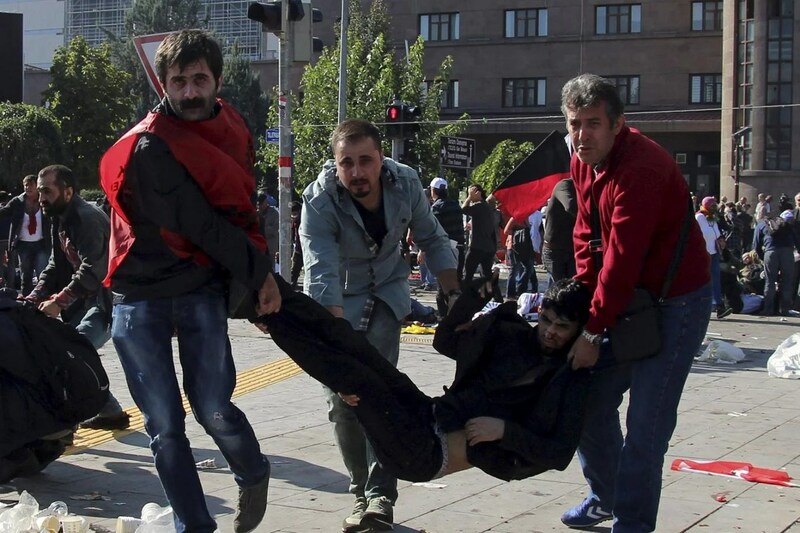 The two explosions occurred seconds apart outside the capital’s main train station as hundreds of opposition supporters and Kurdish activists gathered for the peace rally organized by Turkey’s public workers’ union and other civic society groups. The groups planned to call for increased democracy in Turkey and an end to the renewed violence between Kurdish rebels and Turkish security forces. The attacks Saturday came at a tense time for Turkey, a NATO member that borders war-torn Syria, hosts more refugees than any other nation in the world and has seen renewed fighting with Kurdish rebels that has left hundreds dead in the last few months. Many people at the rally had been anticipating that the rebels of the Kurdistan Workers’ Party, or PKK, would declare a temporary cease-fire – which the group did hours after the bombing – to ensure that Turkey’s Nov. 1 election would be held in a safe environment. Television footage from Turkey’s Dogan news agency showed a line of protesters Saturday near Ankara’s train station, chanting and performing a traditional dance with their hands locked when a large explosion went off behind them. An Associated Press photographer saw several bodies covered with bloodied flags and banners that demonstrators had brought for the rally. “There was a massacre in the middle of Ankara,” said Lami Ozgen, head of the Confederation of Public Sector Trade Unions, or KESK. Health Minister Mehmet Muezzinoglu said 62 of the blast victims died at the scene, while 24 others died after being taken to the hospital. “This massacre targeting a pro-Kurdish but mostly Turkish crowd could flame ethnic tensions in Turkey,” said Soner Cagaptay, an analyst at the Washington Institute. Cagaptay said the attack could be the work of groups “hoping to induce the PKK, or its more radical youth elements, to continue fighting Turkey,” adding that the Islamic State group would benefit most from the full-blown Turkey-PKK conflict. “(That) development could make ISIS a secondary concern in the eyes of many Turks to the PKK,” Cagaptay said in emailed comments, using another acronym for IS militants. The Turkish government imposed a temporary news blackout covering images that showed the moment of the blasts, gruesome or bloody pictures or “images that create a feeling of panic.” A spokesman warned media organizations they could face a “full blackout” if they did not comply. Many people in Ankara reported being unable to access Twitter and other social media websites after the blasts. It was not clear if authorities had blocked access to the websites, but Turkey often does impose blackouts following attacks. At a news conference, Davutoglu declared a three-day official mourning period for the blast victims and said Turkey had been warned about groups aiming to destabilize the country. Yes, quite a shocker brought to you by the same organization that bestowed the Peace Prize upon a man who talked a good game. One who in truth has continued, expanded upon and mechanized the wars attributed to war criminals Bush/Cheney. I suppose civilian deaths by drone are not taken into account either? Not to mention the expansion of the continued erosion of the rights of his own citizens by way of the former war criminals “Patriot Act”, NSA, Homeland Security and any number of Black Ops being funded by taxpayer dollars at any given time. The very same war criminals in fact that many nations wish to imprison for their crimes against humanity. But Obama gets the Peace Prize and his killing spree continues without so much as a peep from said organization. Amid crackdown on opposition, judge also confirms death sentences for 37 alleged Muslim Brotherhood supporters. 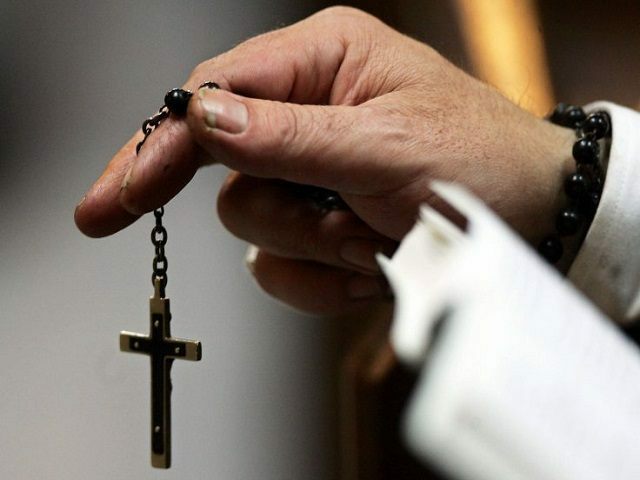 Minya, Egypt – An Egyptian judge has sentenced 683 alleged Muslim Brotherhood supporters to death, including the group’s supreme guide, Mohamed Badie, and confirmed the death sentences of 37 of 529 alleged supporters previously condemned. Outside the courtroom on Monday, when news of the sentences broke, families of the accused began to scream and several women fainted, falling to the ground. The case killed the credibility of the Egyptian judicial system. Mohamed Elmessiry, an Amnesty International researcher monitoring the cases, said they “lacked basic fair trial guarantees”. The defendants from the first case whose death sentences were not upheld were each sentenced to 25 years in prison. Many of the lawyers for the accused boycotted the hearing, demanding that the judge be recused and calling him a “butcher”. Lawyer Mohamed Abdel Waheb, who represents 25 of the defendants, said the verdict was handed down in a court session lasting less than five minutes. Previously, he said, the single session in the trial lasted just four hours, during which the judge refused to listen to any arguments from the defence. Abdel Nasser Hassanien, standing outside the courtroom, said five of his relatives were among those sentenced to die, including his brother, Ahmed Hassenein Abdelatty, 22. “Of the five only one is related to the Muslim Brotherhood, and he didn’t do anything,” he said.